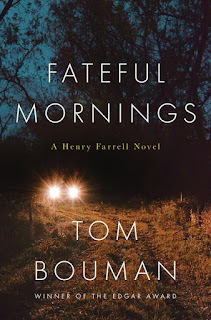 Tom Bouman's first crime novel, Dry Bones in the Valley, earned him a 2015 Edgar Award for the heart-rending and gritty investigation by a local police officer, Henry Farrell, in northeastern Pennsylvania. Released today is Bouman's second: FATEFUL MORNINGS. The title is reflected repeatedly in Henry's discoveries among his neighbors, from wealthy to hardscrabble, as he follows a trail of addiction and related crimes, crossing the trail of a possible serial murderer -- one who must be both clever and deeply disturbed. For Office Henry Farrell in Wild Thyme, Pennsylvania, there are few simple, or simply good, parts of life. Stranded in a small and politically challenging job due to his own past failures, he's struggling to find some beauty anyway: in the forested landscape around him (riven by oil fracking though it is), and in the old-time music he plays with friends (he wanted to call their group the Fateful Mornings from an old tune, but they're the Country Slippers, a local joke about their boots). It's typical of Henry that he's also taking easy pleasure in an affair with a married woman -- a complication that will soon cripple his work, as well as his affections. "Stand up, please." I patted him down, catching body odor that was sharp like cheese, sweet like bread or beer No weapon. I put an arm on his shoulder and steered him to my vehicle. On the drive to the sheriff's, I thought about my visit to their home that winter, and about their history. You show up to a domestic call expecting to see people still in the grip of the fight that got you called out, clawing, screaming. You come to somebody's defense, chances are they let you in on a punch or two. You're the person they hate more than each other. That January night when I had pulled up to the trailer off Dunleary, my blue lights dancing off the white woods, with Swales's house barely visible through the tree trunks, it was quiet. I knocked and stepped inside. The first thing O'Keefe asked me was to turn off my lights to the landlord wouldn't know I'd been called. ... Neither spoke as I stomped snow off my boots and ducked inside. The only signs of struggle were Penelope's flaring nostrils, a butcher's knife in front of her on the table, and bloody paper towels wrapped around O'Keefe's hand. Though the paths through FATEFUL MORNINGS are grim ones, the solid and often lovely writing and the irresistible characters make the book a compelling read. Don't expect an easy ending -- well, we're talking about the 21st-century equivalent of coal country here, aren't we? Even the land is hurting. And its people are in trouble. Which means it's a good thing that all-too-human Henry Farrell is stuck in Wild Thyme, trying to hold a crippled sort of peace. PPS: There are good parallels between this series and Julia Keller's West Virginia crime series. Click here to look at some Keller reviews. I'm a fan of Jon Land's quirky crime series featuring Texas Ranger Caitlin Strong. 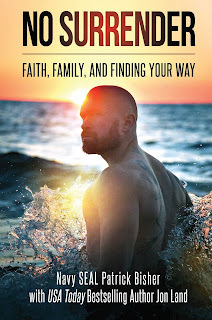 In a startling divergence from his two mystery series, Land's newest book -- on which he is the secondary author -- is nonfiction, an inspirational memoir from Navy SEAL warrior Patrick Bisher. 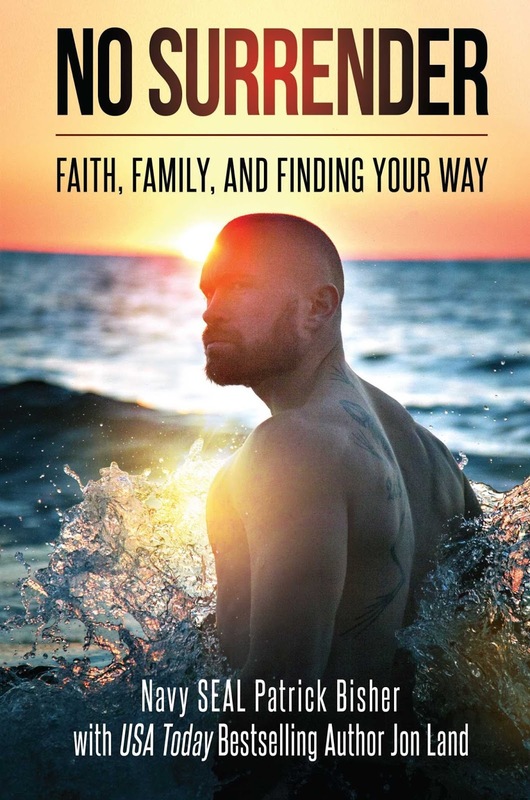 The full title of the book is NO SURRENDER: FAITH, FAMILY, AND FINDING YOUR WAY. Bisher, who suffered a major bone failure as a 9-year-old child that could have confined him to a wheelchair or crutches for life, instead chose to push past enormous physical pain for years, in an effort to keep up with how he saw his brothers -- one living, one deceased -- and a refusal to give up. Although his story is framed alongside his changing faith in God, Bisher mostly narrates his choices as reflecting grit, stubbornness, and a willingness to suffer pain as needed to reach his goals. It's not my kind of book in general, but between Bisher's compelling story and the presumed writing support he had from Jon Land, I found the memoir worth reading, looking always for how this astonishing warrior-in-the-making would cope with his next threatened defeat. If you're looking for a Fourth of July gift to inspire and encourage someone facing a similar set of choices -- including youngsters considering a military career -- consider making this book your patriotic and touching gift to someone this summer. The release date is July 4, from Post Hill Press (already available for pre-ordering online or at your local independent bookstore). 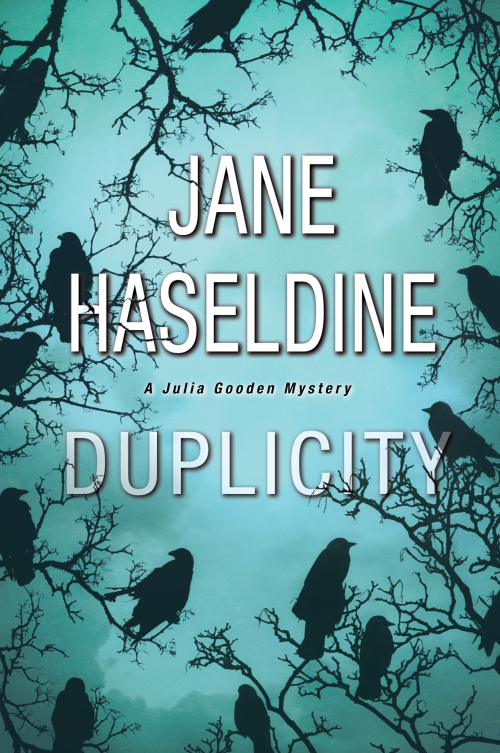 DUPLICITY is the second of the Julia Gooden crime novels -- but the first to come my way. 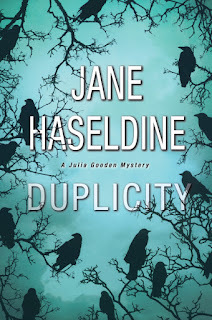 Issued as a hardcover by Kensington, it moves author Jane Haseldine onto the "must collect" list. Not only is this gritty and high-tension mystery set in grim and corruptible Detroit, once the nation's "Motor City"; it takes the classic situation of investigative journalist versus crooked justice, and salts it with mob violence and vicious politics. For Julia Gooden, the job comes first. That makes her a challenging character, when you consider she's also a mom to two small boys -- in fact, almost a single mom, since she's only starting to consider letting her estranged husband back into the family's life. Her career also pits her directly against her husband David at this moment, as he is the prosecutor taking a mob figure to trial, determined to keep witnesses and testimony secret for as long as possible, to secure the safety of those on the stand. When a rival newspaper picks up details that Julia might have exposed if only she didn't have to be so careful of her husband's position, her own job prospects take a hard blow. But that's nothing compared to the violence and risk ahead, as her efforts to keep her family safe take her behind the crime scenes, into serious conflicts of interest. Adding yet another layer of suspense and darkness to Julia's life is her past: not just the years when her marriage "worked" but also the childhood crushed by the kidnapping of her brother, who still hasn't been found -- one reason, in fact, that she's kept her "maiden" name despite marrying. She notices a cardboard box containing David's belongings on a stand next to the bed, including his clothing he had carefully selected for big day one of the trial. Julia inspects the items in the box: David's cell phone, wallet, blue suit coat and dress pants, white button-down shirt with the gold stripes she picked for him just hours earlier. ... Julia tucks the box under her arm as Dr. Whitcomb pokes his head inside the door. "Ms. Gooden, I'm afraid it's time to leave." Julia leans in close to David and whispers in his ear, "I love you. Fight with all you've got." What Julia will later find on that significant cell phone shifts the balance in this intense thriller, and will also affect her interactions with a local police detective. Layer after layer, she's got to figure out who around her is trustworthy -- and whose duplicity is going to wound her yet again. And, oh yes, somehow save her job, if possible. This is a fast-moving and suspenseful tale, with enjoyable complications and twists throughout. Julia Gooden won't be my favorite character of the month -- I didn't like some of her choices, to the point where I wouldn't actually want her as a friend. But that's OK: I still want to follow her investigations, here and in future books of the series. I also get the strong impression that Haseldine -- a former crime reporter herself -- is positioned to get steadily stronger in this genre. Worth going along for the ride! 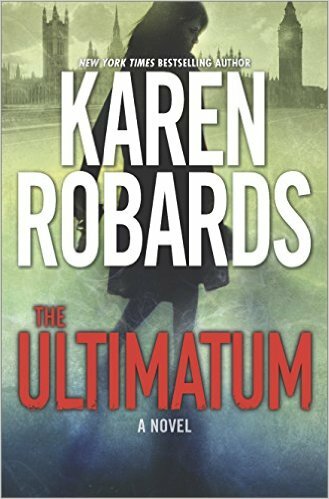 There's a time for hot suspense, and sometimes there's a place for romance -- but in THE ULTIMATUM, the new and exhilarating thriller from Karen Robards, it's suspense and danger that take the hot seat. And that's terrific news, because Bianca St. Ives -- daughter of an outrageous international con man who's taught her the ultimate in survival skills and problem solving -- needs all her wits about her to carry out her own high-stakes tasks. If you've ever wondered where the equivalent of Jack Reacher was for women, the answer is, in this page-turning global crime novel. Bianca's irresistible, a determined young women making fools out of the unprincipled gangsters she's up against. The first hundred pages of THE ULTIMATUM pits her against a misogynous prince of Bahrain, and she's leading a crew of top-notch thieves to reclaim something the prince shouldn't have. But it looks like the whole night's been a setup, to get to her and her team -- or, most dangerously of all, to her father. Doc rose too. "But we can't just --"
"Yes, we can. We have to go," she repeated more strongly and grabbed his arm. "We can't help them. We can stay here and die with them, or we can save ourselves." Strong, fierce, determined -- these are the key words for Bianca St. Ives. She's also hungry for family and loyal friends, and when she finds them under threat, her own actions have one route only: Save them, no matter the challenge. Whether she's negotiating terms on a boat at sea or struggling for footing on a snow-covered mountain, her extreme fitness skills and her desire to follow the quest her dad instilled in her drive her into high action and hair-raising hunts -- where she is sometimes the hunter but just as often, the prey. Robards salts the adventure with a deft touch of sexual tension, since one of Bianca's opponents has an odd knack of taking her breath away. But it doesn't stop Bianca, or deter her. Not at all. I kicked myself as I reached the final chapter, having only just realized what the book's title suggested; some readers will figure that part out much sooner than I did. More importantly, I hated to turn the final pages. Good thing this is the start of a series, even if the name "The Guardian Series" sound more like sci fi than international thriller. Hmm. When you've devoured your copy (turn off all distractions), let me know what you think. No spoilers, though! Robards, by the way, is the author of more than 50 novels -- if, like me, you haven't sampled her work before, that may be because a her early work was romantic suspense, then contemporary suspense. I'm hoping she'll stay with intense thriller as her long-time genre, now that she's broken into it so boldly and marvelously. Quick comparisons: Less emotionally torn than Taylor Stevens's Monroe, not as wounded at Carol O'Connell's Kathy, but a bit more complex (and hence engaging) than Jack Reacher. Grab a copy. Summer reading season is fully here, and with it, a crop of new mysteries to enjoy. I'm especially glad that DEATH ON NANTUCKET came my way. This fifth in the Merry Folger Mystery series from Francine Mathews is a smoothly written, tightly plotted detective novel based on one of the classic mystery tropes: the death of a wealthy head of the family, with a circle of possible beneficiaries in the house. 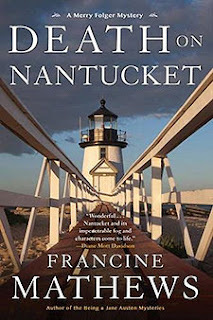 Investigating for the Nantucket police force is Detective Meredith Folger, who needs to have her A game lined up: Not only is Spencer Murphy a famous and powerful former war correspondent with a fortune amassed from his books -- but the death of his (unknown to many) adopted daughter as the July 4th weekend opens puts pressure on Merry to quickly get the facts, make a determination, charge someone or not, and have it all wrapped up politely before the weekend ends. At least, that's what her highly critical boss expects from her. Merry's own past -- lightly and deftly sketched in by Mathews -- includes having to fight for her own upcoming wedding ceremony to be on her terms, not those of her powerful mother-in-law to be. The challenges of both work and home help her to tune in quickly to the Murphy family undercurrents. Loyalties cut both ways, Spencer Murphy is losing his own truths to dementia, and the family's youngest member on scene, young college grad Laney Murphy, seems the only person willing to be fully honest as Merry sorts through motive, means, and abundant opportunity. This is a great traditional mystery, one of the most satisfying I've read this season. 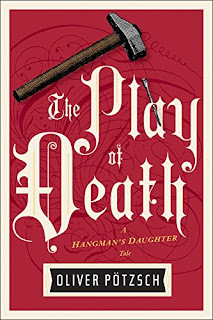 I recommend it highly, and will scramble to line up the earlier titles for my own summer reading pleasure: Death in the Off-Season, Death in Rough Water, Death in a Mood Indigo, Death in a Cold Hard Light. Although the series is new to me, I'm already a fan of what Francine Mathews writes under her other nom de plume, Stephanie Barron. The author lives in Denver, CO, but clearly knows Nantucket well -- and is a former CIA intelligence analyst. Newly released today, from Soho Crime. And I have a list of people for whom to buy copies already! Good news for Cara Black mystery fans -- number 17 in the very entertaining Aimée Leduc series is released today. 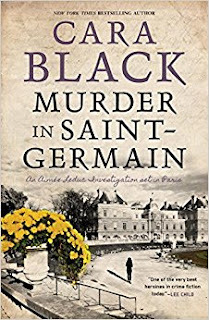 And MURDER IN SAINT-GERMAIN takes the Parisian detective in a fresh new direction: sorting out an espionage-related set of crimes that cross her path. That's not simple for the new and mostly single mom who runs a cybersecurity firm, where ideally she could stay at a desk like her detection partners, checking videotape and files. But even that turns active in this mystery, with a client demanding in-person service that sends Leduc scrambling for changes of couture -- and there's nothing like scrambling across rooftops encrusted with pigeon waste, to make a gal pull off her designer footwear and tackle the task barefoot after all. Aimée Leduc is also scrambling for child care, as her darling baby, newly mobile, needs careful care, but the usual caregivers aren't available. When Melac, the baby's hunky but disloyal dad, steps up to cover the gap, a mysterious woman that Melac introduces as his mother (who knew?!) also enters. Even while sorting out Bosnians, Serbians, and war criminals, Leduc's own confused past keeps claiming her attention. Is her godfather, Morbier, dying in a hospital as a result of her own actions? Has she been unfair? Do the Paris police care whether she was right or wrong, or will they simply all make her life harder as punishment for her injuring their hero, Morbier? This one's a lively page turner, and even comes with a map to help put the detection and suspense into geographical perspective. Series fans will find it a "must"; if you're new to the series, it still reads well, but you may want to skip back a couple of titles to get background on the sometimes chaotic issues and relationships! Otherwise the sometimes choppy chapters can be a bit distracting. As I write this, Paris is in the breaking news for an attack on a police officer at the cathedral of Notre Dame; better to have the crimes in the fiction instead. Add this one to the summer reading stack for light fun. Part of the fun of global culture is catching up with a book that's already been a bestseller "someplace else." 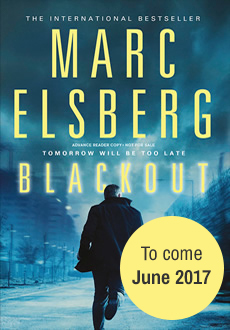 Marc Elsberg's thriller BLACKOUT, released in hardcover in the US today, took Europe by storm in 2012. Fun to have this all-too-believable page-turner come across the ocean! Elsberg lives in Vienna, Austria, so BLACKOUT is a translated crime novel -- but Marshall Yarbrough's skills make the change of language invisible. The book's premise is that the interlinked power grids across Europe could be triggered to fail, through relatively small and workable changes in the software that runs the generating stations, from hydro to nuclear. Spinning the thriller into deeper intrigue is the notion that today's computer hackers could make those changes. And then, bang, we're into food shortages, hospital issues, transport failure, lack of fuel, and soon, political unrest. It's hard to avoid spoilers on this one. So I'll just add that the book's written in very short segments, alternating points of view every couple of pages, or sooner (if that makes you crazy, don't open this one). The characters are clever but not deep; it's the plot and the relentless action that make this a powerful and yes, anxiety-arousing (!) read. It's not going to bind you to the protagonist the way a Lee Child crime novel will, but it moves as quickly (or more so), and I do believe the author's claim that it provoked a lot of security changes in the power industries! Even though I'm keeping this short, I enjoyed every minute of BLACKOUT and am going to get multiple copies, for all the friends and family members who won't be able to put it down. Hope you can grab a copy ASAP. Move it to the top of the summer stack -- so you'll be prepare! 1. You collect the reading experience of mysteries set in Bavaria. 2. You like fiction set in the 1600s. 3. You're planning to see the Bread & Puppet Theater in action in Vermont (or treasure having done so in the past, especially in the 1970s and 1980s). At the heart of this somewhat awkwardly translated mystery (reminds me of the translation of P.J. Brackston's books, also set in Bavaria) is the annual passion play in Oberammergau -- which in many ways is a precursor to the grand spectacles that Bread & Puppet created. The second strand is what life is like in a caste-conscious society when you're part of a hangman's family. And the third, of course, is a murder and finding the dangerous criminal responsible. It is 1670 and Simon Fronwieser is in the town of Oberammergau to bring his seven-year-old son to boarding school. As he bids his boy a tearful farewell, news comes of a shocking murder: the man who was to play the part of Christ in the town’s Passion play has been found dead, nailed to the set’s cross. As there is no doctor in town, Simon is brought in to examine the body. The opportunities to spend more time with his son and to investigate the murder quickly convince him to stay. 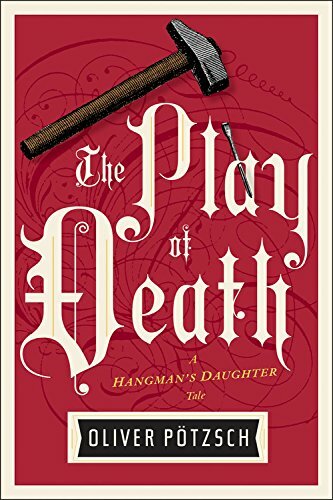 Soon he is joined by his father-in-law, Jakob Kuisl, the Schongau hangman, and the two begin piecing together the puzzle of the actor’s death. Was he murdered by a jealous rival? Are the recently arrived and unpopular immigrant workers somehow involved? Or is it a punishment from God for the villagers’ arrogance in trying to schedule the play four years earlier than prescribed by ancient custom? Once again it looks like it is up to the Kuisls to unravel the mystery and bring a town’s dark secrets to light. 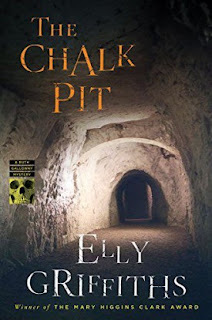 British author Elly Griffiths writes two distinctive mystery series, one set "today" in and around Norwich, England, rich with archaeology and very British themes, and the other involving stage magic and illusion plus murder, circa 1950. I'm a fan of both. Just released this week in the US is the newest in her Ruth Galloway mystery series, featuring a forensic archaeologist who's also a single parent in a very complicated network of university politics, local police, and the remnants of England's past -- which in Ruth's case includes a significant friendship with a modern-day Druid. No fancy paranormal side effects in here, unless you count the occasional strong intuition that Ruth and her friends may experience. Instead, THE CHALK PIT provides the perfect summer read: a strong traditional mystery with powerful motives (money and power! ), and heart-stirring secondary plotting among the homeless in Norwich. "Anyway, it's likely that the bones are medieval or even older. There's no flesh on them and they look very clean. It's just ..."
"What is it, Ruth? I know there's something you're not telling me." "It might be nothing. But one of the long bones was broken in the middle and there were cut marks on it. And the bones were so clean, almost shiny. It reminded me of something that I've read about. Pot polish." "Pot polish? Sounds like something my granny would do." "I doubt it. It's when bones are boiled soon after death. The polish comes from the contact with a roughly made cooking vessel." "Jesus wept." Nelson chokes on his last crumb of cake. "Are you saying these bones were in a cooking pot?" While Ruth keeps that aspect as quiet as possible, she's getting crowded by fellow academics who want to push into the underground labyrinth with her, and some have motives that worry her. Meanwhile, Nelson's team, especially DS Judy Johnson, has another reason for interest in those old tunnels that were once part of the region's chalk-mining industry: Could homeless people in the area become crime victims of someone living "underground" and kidnapping them, or worse? Griffiths keeps the twists spinning, enlivened by Ruth Galloway's confused "love life" that tugs her in as many directions as her work does. Lively storytelling, quick surprises, and a lot at stake make the book a very good vacation from ordinary daily life -- and from the lawnmower and garden! Great that Houghton Mifflin Harcourt has brought this series across the Atlantic.